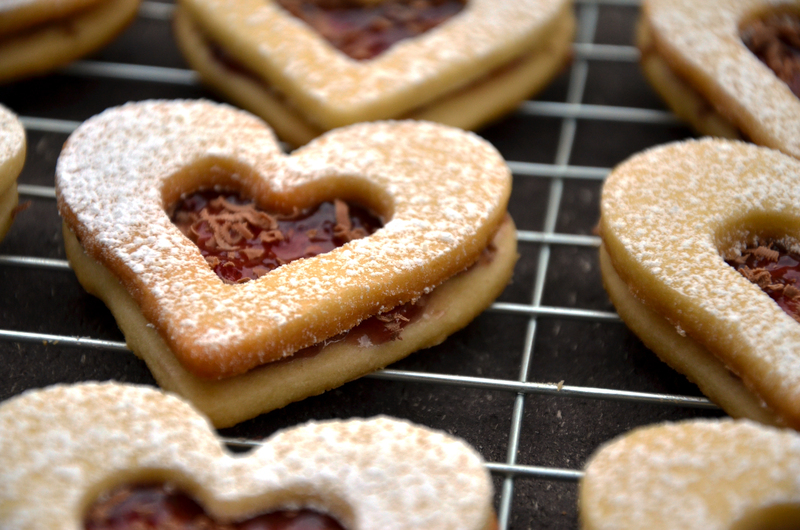 While traveling through Europe, I’ve been known to make an entire day’s meal out of linzer cookies, the lovely shortbreads filled with jam and sprinkled with powdered sugar. They’re delicate and not too sweet, with a hint of tart from the jam. Traditional linzer cookies are made with almonds, but this is a lighter and smoother variation, with an added touch of chocolate. I like baking things that turn out pretty. It’s even better if they’re pretty and delicious. Yes, they’re all butter. But if you do ten jumping jacks while waiting for them to bake, you’ll be fine. 2. In a medium sized bowl, mix the flour and salt. 3. In a large bowl, beat butter until smooth. Add vanilla extract and powdered sugar and beat until smooth. 4. Add flour mixture to wet ingredients and stir until just combined. 5. Separate dough in half and using a rolling pin, roll each portion into 1/8-1/4 inch thick flat sheets. 6. Place sheets of dough in freezer for 5-10 minutes. *This is where it gets tricky. I found that if the dough is too frozen, the sheets become brittle and impossible to cut with cookie cutters. If the dough is too soft, cookie cutters won’t work either. I found re-freezing the sheets for a few minutes throughout the process helped. 7. Cut out all the dough with the large cookie cutter. Refreeze the cut shapes before cutting a whole out of half the shapes with the small cookie cutter. Half your shapes should be whole, and half your shapes should have a hole. Too many (w)holes? 8. Freeze the cut dough for a few minutes before baking so the cookies maintain their shape in the oven. 9. Bake for 8-10 minutes, until just barely golden. 10. Transfer to a wire rack and let cool. 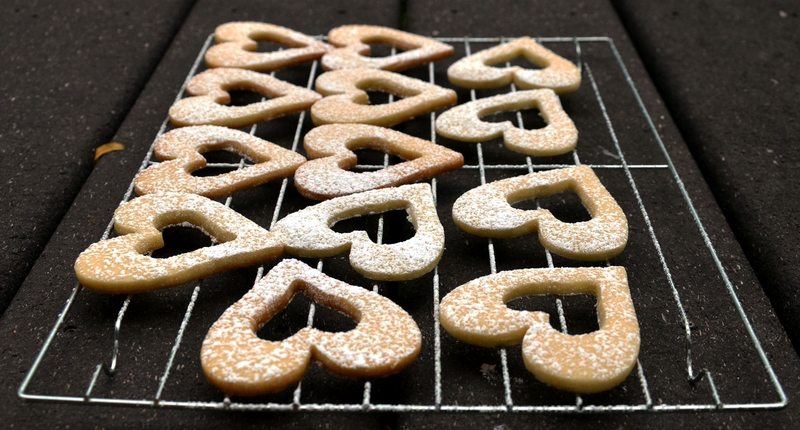 Be gentle, shortbread is very delicate and crumbles easily. 11. 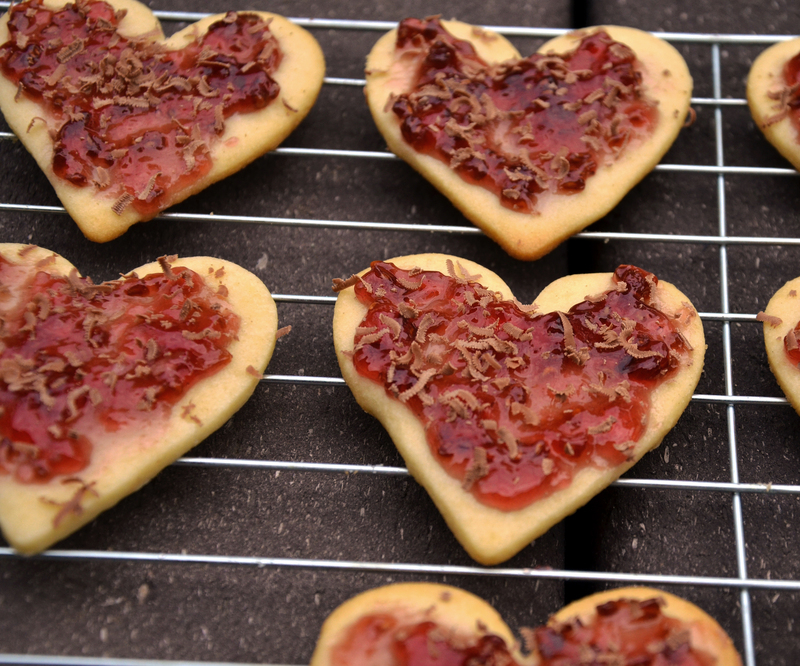 Spread raspberry jam on the whole cookies. Grate a bit of chocolate over the jam. 12. Using a sifter, sprinkle powdered sugar over each cookie with a hole. 12. Place a hole cookie over each jam covered whole cookie, powdered sugar side up, making a sandwich with a little window. Ta da! Fancy looking European style cookies.